Miso soup is a Japanese soup, which is traditionally made with a stock called dashi. 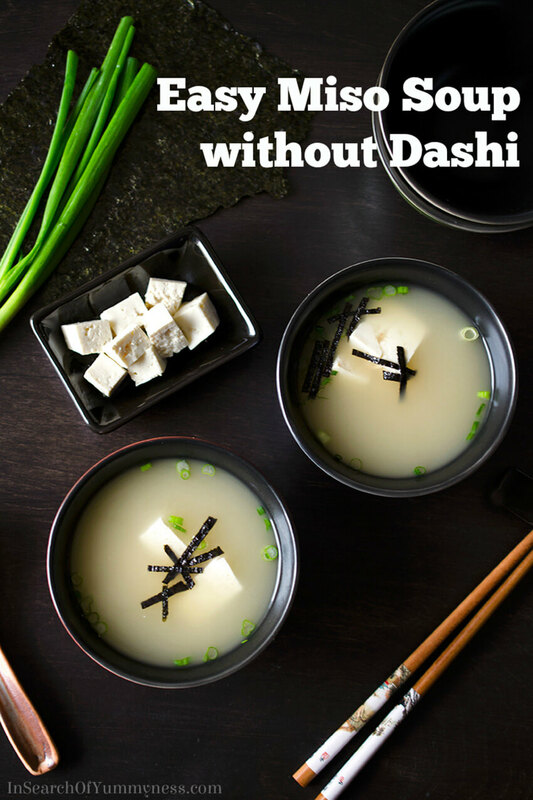 If you don’t have dashi, and don’t want to make your own, that’s ok! 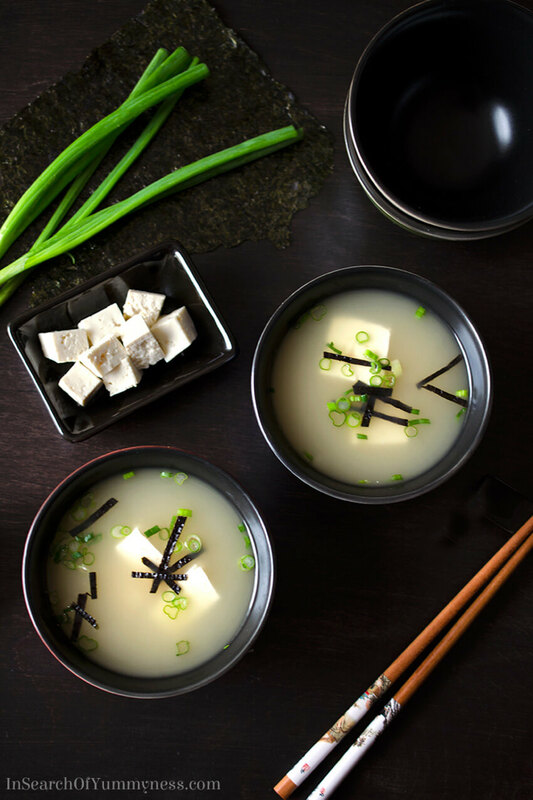 Keep reading to learn how to make a tasty miso soup without dashi. Miso soup is one of my favourite dishes to order when I go out for Japanese food. It’s a simple dish – just broth with miso paste, a sprinkling of green onions and tiny pieces of tofu. Yet, like a really good chicken soup, it’s both delicious and comforting. Comfort is something that I’m clinging to right now, because my year started off in a very uncomfortable way. I had been sick all through December, but thought that maybe I just had a flu bug. It seemed like everyone was sick around Christmas, so I didn’t think much of it. Then at 5:30am on January 1st, I woke up with searing pain in my left arm, shoulder, neck, jaw, chest and back. Being the stubborn person that I am, I tried to rub muscle relaxant on it and ignore the pain but that didn’t last very long. My mom eventually persuaded me to let her take me to the hospital, because that kind of pain can be caused by a heart attack. After spending 20 hours in the ER having multiple blood tests, a chest x-ray and a CT scan, they couldn’t tell me why I was having pain. We did discover another issue that I need to keep an eye on though, which I would never have known I had without getting the CT scan. Funny how these things work right? I’m still in the process of having tests done and waiting for results. Meanwhile, I’ve been told that I need to avoid caffeine, alcohol and fast food, and increase my intake of probiotics. This is where the miso soup comes in. I recently found out that miso is a good source of probiotics (healthy bacteria) that can be beneficial to people who are having digestion issues. 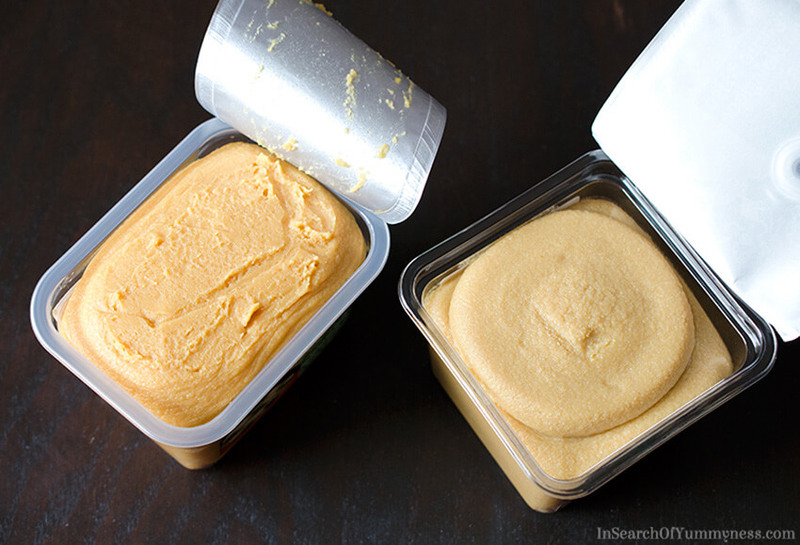 It’s important to buy organic miso paste if possible, which is usually found in the refrigerator section of your grocery. The organic stuff does not contain ethyl alcohol and it has much less sodium, unlike the shelf-stable versions of the paste. After Googling what goes into miso soup, I figured it would be easy. All you really need is dashi (a Japanese stock), miso paste and a few toppings. It’s easy, they said. Ha! I went to multiple grocery stores and couldn’t find dashi anywhere. Well, that’s a partial lie. 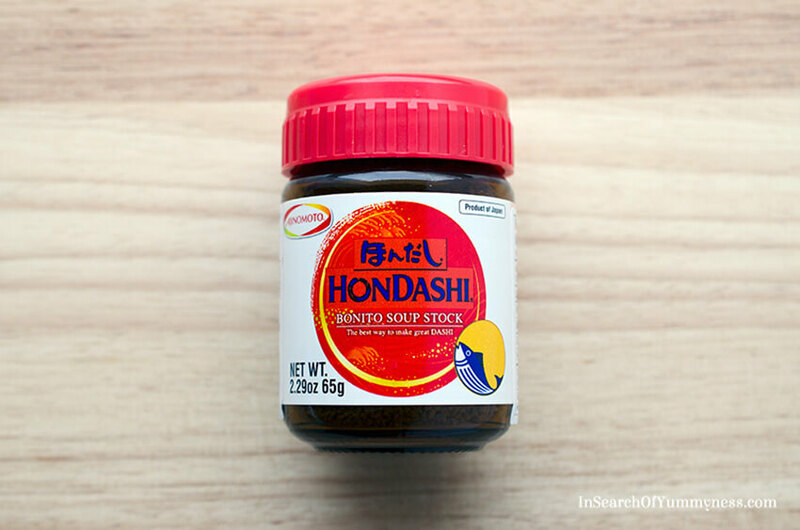 We did find Hondashi, which is instant dashi powder. But the first two ingredients were salt and MSG. If I want to eat miso soup for the health benefits, it doesn’t make sense to make it with MSG right? So then I thought, why don’t I just make the dashi from scratch? So I set out to find bonito flakes (dried fish flakes) and kombu (dried kelp) to make the classic version of the stock. I couldn’t find kombu in any stores, but did manage to find it online. I decided not to buy bonito flakes, because I remembered that I had used them when I worked on The Main, and didn’t like the smell of them. So instead, I bought dried shiitake mushrooms which are used with kombu to make a vegan version of dashi. I happily added the kelp and mushrooms to cool water, and let it sit for about three hours. According to the kombu package, you’re supposed to let it soak overnight. I thought that the water would take on a mild flavour after a few hours though, so I only left it soaking for about 4 hours. I went into the kitchen to taste the broth, and was immediately struck with a horrible smell. Similar to the smell you get when you return from vacation to find your fish tank covered in green stuff. I had to taste it though, you know, for science and progress. I dipped a spoon into the water, and just barely let it touch my tongue. Oh my goodness. Honestly, I don’t think I’ve ever tasted anything so horrible in my life. And I’ve eaten some weird stuff. No amount of tea, milk or water would remove the dirty fish tank taste from my mouth. I sadly ended up pouring the whole thing down the drain, opened my kitchen window, and lit 3 scented candles before giving up on the recipe for the day. I really have no idea what went wrong! I did try making dashi again, this time from just the shiitake mushrooms soaked in water. The result was better, but it had a bitterness that I didn’t really like. I used lukewarm water and left it for about 4 hours, so I’m not sure where I went wrong with this one. Maybe it was just too many mushrooms for the amount of water I used? Clearly, I need to do some more research before attempting to make dashi again. After testing my miso soup recipe multiple times with various stocks, I figured out a few things. First, you can make miso soup with just water, but the resulting soup is kind of bland. Vegetable stockworks just fine, as does fish stock (although I used a fish stock cube, which was saltier than I would have liked). 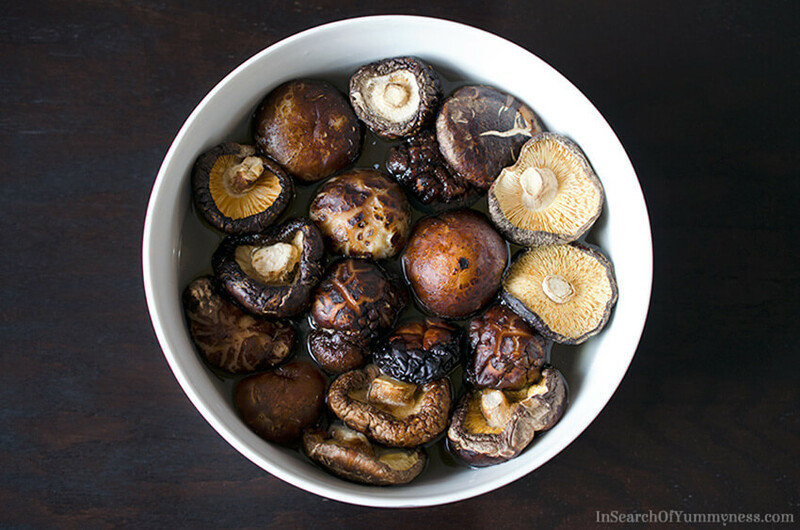 My friend Lisa over at The Viet Vegan says she uses a store-bought mushroom stock for her miso soup. Chicken stock is the only stock that really doesn’t work if you’re going for that traditional miso soup flavour. 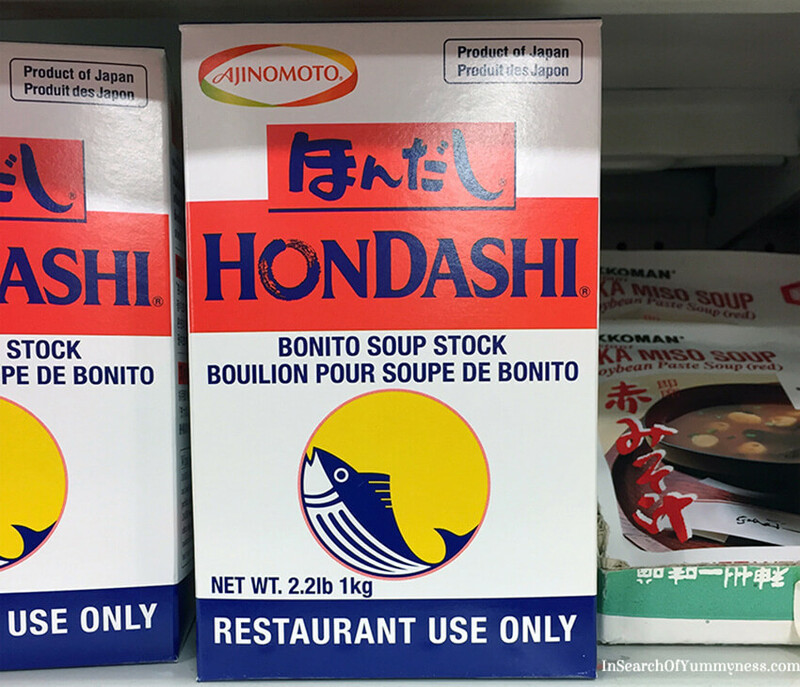 That’s not to say that you can’t use chicken stock, which actually makes a tasty miso chicken soup, but just be prepared that it will taste very different from what you get at the restaurant. If you want to get that restaurant taste, without making your own dashi, you really have to use the instant dashi powder. Mandy found a small bottle for me when we were shopping for the Singaporean Style Slaw recipe, and the miso soup I made with the powder was really tasty. The first two ingredients are salt and MSG though, so if you’re looking for a healthy bowl of miso soup, this is probably not the way to go. There are no instructions on how to properly dilute the stock on the bottle, so I used this blog post from Steamy Kitchen as a guide. Regardless of what you use for your broth, there is one really important tip that you need to keep in mind when making your miso soup. Do not boil the miso paste! Boiling the paste makes it become grainy in texture, and you risk losing the health benefits too. Instead, take a bit of warm broth and melt down the paste before adding it to the soup. 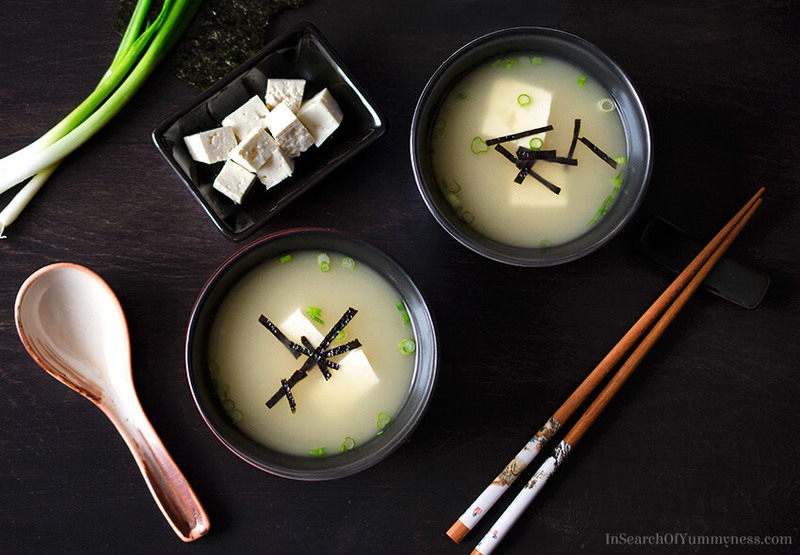 This easy miso soup recipe omits traditional dashi in favour of easier to find stocks. In a small saucepan, bring the stock to a boil. Add tofu cubes and reduce heat to a gentle simmer. Meanwhile, place 1/4 cup of miso in a medium bowl. Add 1/4 cup of the warm broth from the pot to the bowl, and stir with a spoon to liquify the miso paste. Remove the saucepan from heat, and skim off any residue (white foam) that may have formed on the surface of the broth. Stir in the liquified miso paste into the broth to combine. Taste the broth. 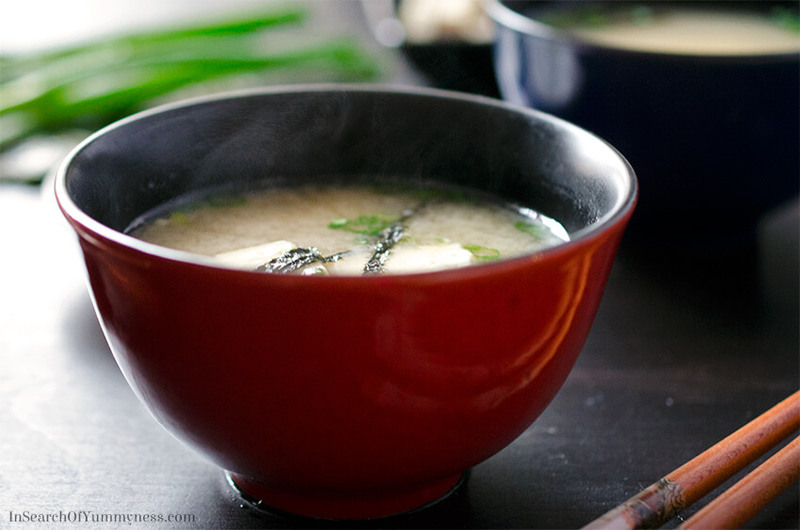 If you find it needs more flavour, you can add more miso to the soup one tablespoon at a time. Ladle the soup into bowls and garnish with green onion and roasted seaweed, if desired. Dashi is a pain to make! I’ve been there. The end result looks yummy tho! I was so frustrated that I couldn’t get it to work! I looked up several recipes and couldn’t figure out where I went wrong. The end result was tasty though 🙂 Thanks for stopping by! I hope you are feeling better soon and get good rest results back! Miao soup is always a treat but I have yet to venture into making it. When I finally get the guys, I will be pulling-up this post! I am glad you noted not to use chicken stock as I soooo would have! Thanks Amanda! I’m hoping for good test results too. Thanks for reading my post! And no problem about the chicken stock – I didn’t realize it wouldn’t work until I tried it! I must say, as a die-hard scratch-dashi fan, I wonder what went wrong myself. The briny, seaweedy taste of good dashi can be a little unfamiliar for sure, but I’ve never had a batch turn out so… well, fish-tank-y. I wonder if it was the kombu itself? 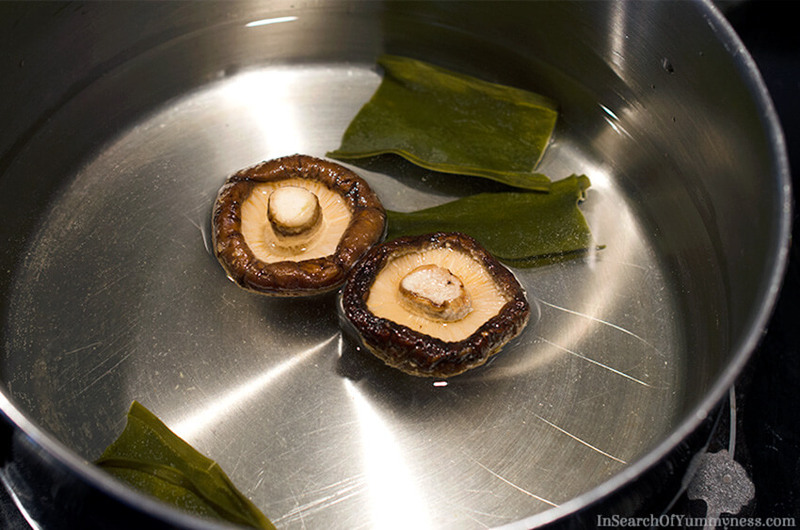 I use a slightly different method for my kombu – I soak the kombu in cold water for a little while, then heat the water and remove the kombu immediately before it boils. Then I add my katsuobushi and let it sit for only a few minutes (I find the smell of katsuobushi MUCH stronger than the taste of the end product, but I do know what you mean). I do know that boiled kombu can become quite bitter, but it doesn’t sound like you did that here. In any case, I applaud your efforts, and I hope future attempts go a little more swimmingly (no fish tank pun intended). You’ve done a great job of putting together a good miso soup here regardless, and I think your tips are pretty useful. And honestly, I bet it’s a far site better (and healthier) than the average miso soup made from a packet! Ahahaha, swimmingly! Thanks for your feedback on the post Sean. I really have no idea where I went wrong. The liquid was so funky and off-putting, I could barely put it in my mouth! It wasn’t bitter, but like… dirty tasting? It could have been the kombu… I bought it online because I couldn’t find it in store. I followed the directions to make dashi from the package, but just didn’t leave it for the full 8 hours. Total failure. I may try again in future if someone can recommend a good brand of kombu.